Breathing is consciousness. Breath is the activiating principle that determines the form of consciousness. Conscious breathing is one of the most powerful ways in which both individual and group consciousness can be offered in the service of universal transformation. Why is this so? Conscious breath represents more than merely the principle of inflation and deflation of a biological organ used to maintain the survival of organic life-forms at an instinctive level of functioning. Conscious breathing has the potential of interconnecting and integrating all levels of energy in the universe. At least, these ideas are clearly held to be true by a variety of teaching traditions from Eur-Asia to the Middle East to the Americas. 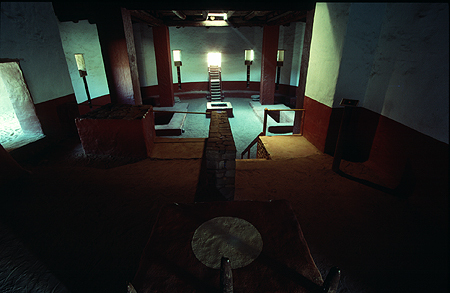 One of the major work activites in the great kivas, such as Casa Rinconada at Chaco Canyon, was called the Universal Breath Prayer or Breathing the Universe. 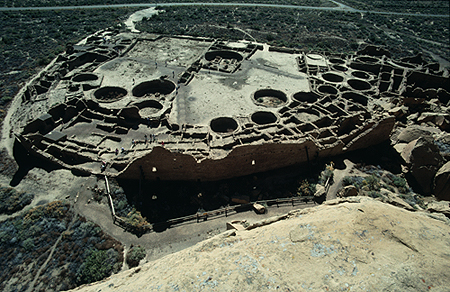 This particular practice involved the entire community, and in effect was a culmination of the preparatory work that had been done during the year by individuals and kin groups in the kin kivas. The individual spiritual practices that had been carried out by each member of the community were now integrated into the greater work obligation that could only be accomplished by the unified being intention and aim of the group as a whole. In essence, through a series of graduated steps, the individual became harmonized first with their own organic form, the organic form of their kin group, then the organic form of the culture. Once this preliminary harmonization was complete, a second essence based harmonization took place in which the individual now worked on conscious recognition of their specific spiritual typology, the essential typology of their kin group and then the essence characteristic of the culture. Spiritual initiates who could be consciously present from the view of this cultural essence took on the role of teachers and guides for the rest of the community.